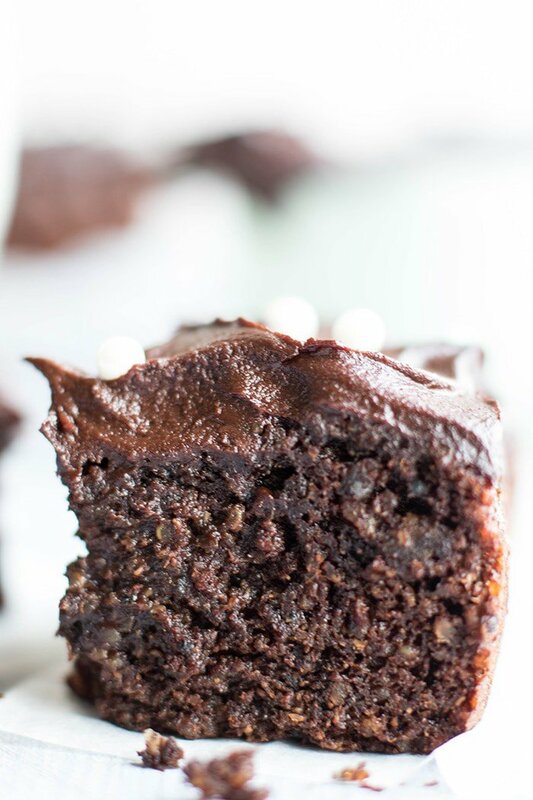 This Chocolate Quinoa Cake is easy to make, light and fluffy, and very similar in taste to a traditional cake. It is sugar free and sweetened only with fruit. 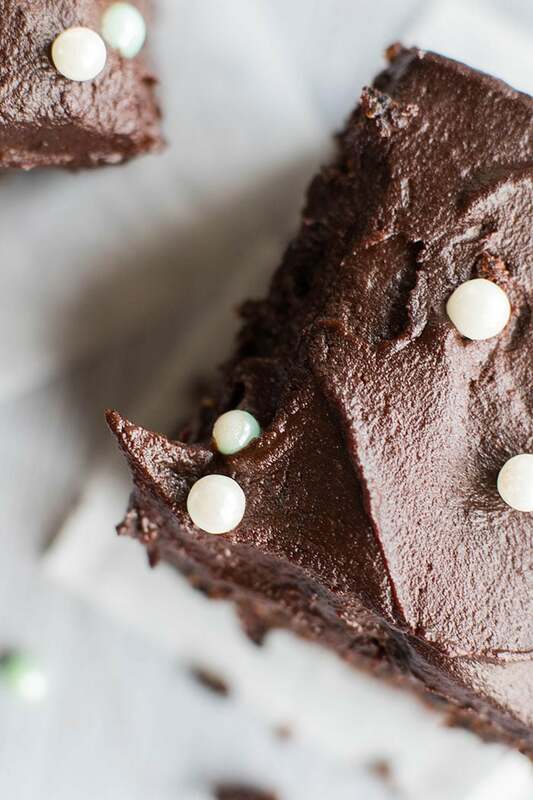 We love it with my (sweet potato) Healthy Chocolate Frosting. This chocolate quinoa cake was a happy mistake. A very, very happy mistake. A few years ago, Starbucks started carrying gluten free quinoa brownies. I loved the idea– but the reality was they were uber-sweet, and the ingredients were corn starch and sugar, with a little bit of quinoa in the mix. I’ve been meaning to recreate those brownies with healthier ingredients and less sugar since I discovered them. I loved the little pops of quinoa– they were made with whole cooked quinoa, not flour. I’ve made about 15 batches the past month trying to figure out how to make a brownie-textured dessert, and what I’ve ended up with are lots of dense brownie energy bars (awesome in their own way– we have been loving them smeared with sunflower butter), and cake. Light, fluffy, perfectly sweet, but not-too-sweet, cake. 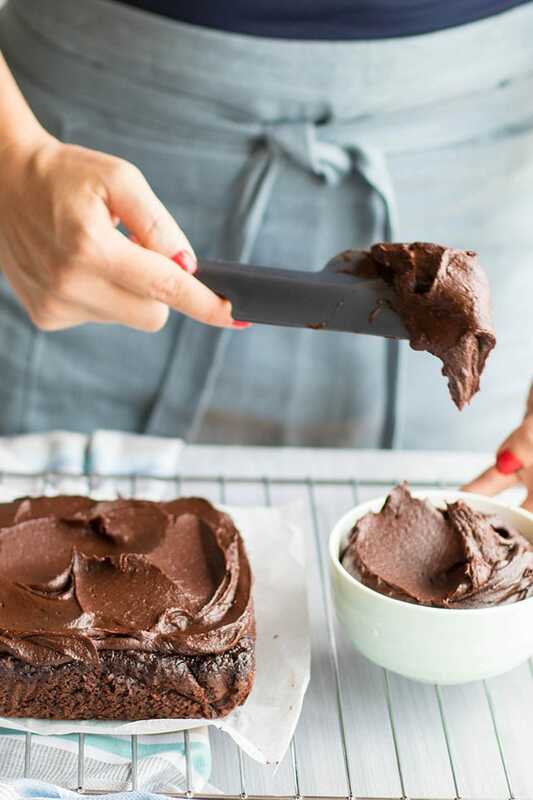 Cake that inspired this amazing healthy chocolate frosting — a fudgey treat made with a base of sweet potatoes! Both recipes are gold mines. They are certainly ones that will be made over and over again in this house. 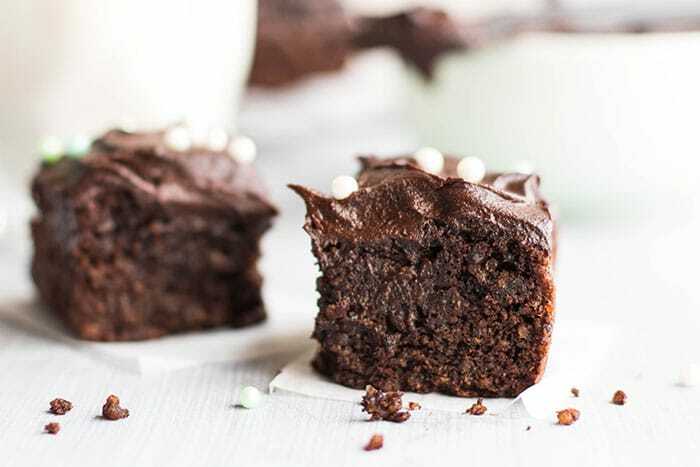 Just to be sure, I’ve tested these out on a few recipe testers who aren’t used to my lower sugar, healthier desserts, the the overwhelming verdict was that these “just taste like chocolate cake.” Thumbs up. This cake is meant to have some of the quinoa texture, so don’t worry if your batter still has pieces of quinoa– these give the cake an interesting texture, but really aren’t very noticeable. Make it Gluten Free: Quinoa, arrowroot, and cocoa powder are naturally gluten free, so this cake is a great option. Make it Ahead: This cake makes amazing, firm slices– nothing crumbly here! It freezes perfectly. Just wrap it up tightly in wrap or a freezer bag, and then defrost and store in the refrigerator when ready to use. 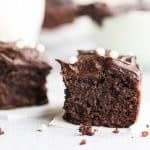 This delicious and unique chocolate cake recipe is made with gluten free quinoa and almond flours, and is entirely date sweetened! 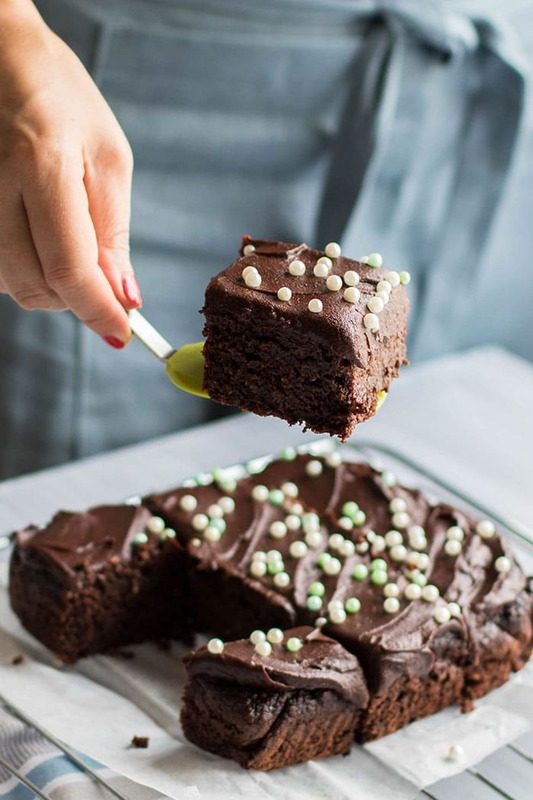 The perfect sugar free chocolate cake so you can enjoy dessert more often. Line an 8x8 pan with baking paper and set aside. Pit dates, and then pour boiling hot water over the dates and allow to sit for 1-2 minutes to soften. Drain dates well, and then add to a food processor with cooked quinoa. Process for 1-2 minutes until the dates are broken up. Add coconut oil, eggs, and vanilla, and process for another 1-2 minutes, until the dates are broken up, but there is still some texture to the quinoa. This can also be done in a high speed blender, but the goal isn't to have a completely smooth batter, so don't over process. Add cocoa powder, arrowroot, sea salt and baking soda, and then pulse to combine (use a spoon to stir in any dry ingredients after pulsing 5-6 times). Pour batter into prepared baking dish, and use a spoon to smooth over the top. Allow to cool at least 15 minutes before cutting. I fully cool, frost, cut into bars, and keep in the refrigerator. Refrigerate for 4-5 days, or freeze for up to a couple of months in a well sealed container. *I provide the amount of dates in weight because different varieties of dates have different densities. A cup of medjools equals about 2 1/2 cups of a smaller date variety. O yummo! Love the real quinoa in there! Quinoa cake? Sweet potato frosting? You're an absolute GENIUS! I'm super excited to try this cake, I bet it tastes just as amazing as it looks! It really is amazing. I have had to make this for several friends to validate my feelings towards this cake because I often eat strange things-- but this is all around amazing! I'm a huge fan of quinoa but still haven't tried baking with this. This cake looks so rich and indulgent! Thanks Jane! The frosting is amazing. So is the cake. These are my favorite recipes in a while! Thanks for the pin. This looks absolutely delicious - moist and flavorful! Thanks for those tips at the end...so very helpful! I've never seen quinoa in cake. This looks absolutely delicious! So moist! Yes, this cakes stays really most because of the whole dates in it! We are loving it. i have made cookies with cooked quinoa and loved it..im very interested to try this cake now..love love your photos. Nifty idea! Now we can get out sweets and protein in one dish. LOL. Seriously, these look so moist and yummy and it's a really great way to get the kids to ingest extra protein! Yes! I love making treats like this for my family. I took this cake into my husband's office, and they couldn't believe I was letting my 19 month old have chocolate cake-- but the main ingredients are quinoa, sweet potatoes, and dates! So I am more than okay with it. He also thinks "ice cream" is frozen processed bananas, and I will keep it that way for as long as possible. Never tried Quinoa cake...but this looks so moist and yumm! I actually got the idea from Starbucks, of all places! Here in Asia they are making gluten free brownies out of whole quinoa and I thought it was a great idea. Quinoa in cake?! Who knew this was a thing! That is really awesome! Wow, we don't have green banana biomass -- so I am not sure. Arrowroot is the same thing (essentially) as tapioca. If you can't get tapioca, you can try glutinous rice flour (sweet rice flour). And if none of those are options, corn starch! 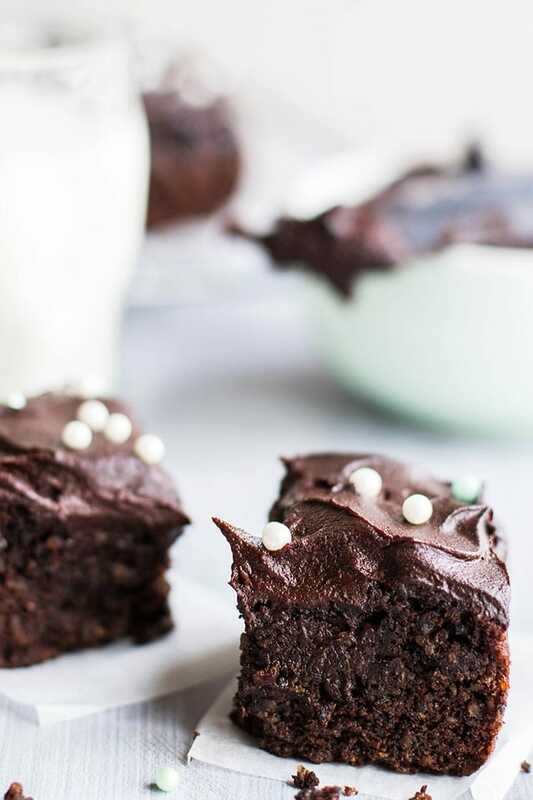 The frosting on here is amazing-- we have it in our fridge all the time now, because my husband likes to top his yogurt with it :) Thanks for stopping by and letting me know you found my blog! Arrowroot is sometimes used in Tapioca, and tapioca is a blend of different roots of the same type. It's actually not as processed as it seems! I stayed away from it for a long time because of its appearance, but then I kept coming across information about it and realized it's actually very good as far as starches go. The "processing" is minimal and natural, and the result has a lot of vitamins and minerals, and is even high in protein for a starch. Is it as healthy as the quinoa? No. But as a secondary ingredient, it's a great choice-- read about it in my Raspberry Pear Coffee Cake Post, or here. It's getting easier and easier to come across-- if you get Bob's Red Mill products where you live, you can probably find arrowroot.I am sure I can buy Green Banana biomass in the States, but right now I am in Malaysia! I will make a note to order some when I am back in the States in a month or so. I'd really love to find something like that to use in my baking-- high in resistant starches! I saw you signed up for my mailing list-- great! So you will see when I start experimenting with it! And yes-- the frosting recipe is posted! It's linked in this post, or search desserts and it's a pretty recent post. Hello Mita! Wonderful to hear from you. I have never used aquafaba, so I really don't know. I am sure with the stickiness of the dates, you could use an egg sub. The egg sub I use when I do vegan baking is flax or chia seeds and water (1 tablespoon of seeds to 2-3 tablespoons of water). I imagine using a sub will make the cake a little more dense, but equally as delicious! Please let me know if you try a substitute and how it went! Oh Maria, this is such a kind comment, and I really appreciate you coming back to let me know! I really love this cake. I need to make it again soon. My son and husband are chocolate lovers and I like knowing they are getting something healthy when they are having dessert every night! Could you use quinoa flakes for this instead of quinoa? Hi Sarah, Sorry for the late reply -- been traveling! I wouldn't try subbing quinoa flakes. It's much different. I am sure you could come up with a good recipe using the flakes, but I have a feeling it wouldn't work as a direct sub. Other ingredients would have to be changed as well. Are the dates used in the recipe raw whole dates? I can only find dried dates (pitted) in the grocery stores nearby. I use dried dates! If you buy small dates, you'll need to soak them in hot water for a few minutes so they easily break up when you process them. Make sure all the pits are removed -- I had "pitted" dates and used them in a recipe last week and ended up with a couple pits that broke apart in my batter :( Good luck! Love this cake. Michelle, do you have any suggestions if I would like to make chocolate quinoa muffins? Do I need to alter the recipe a bit? Thanks in advance! OOh, I do love this cake! Quinoa in cake? I'm so intrigued! It certainly looks delicious! Ooh, it is so delicious! Gives is a subtly earthy flavor and then a little "pop" texture. We love this cake. Hi Michelle! I just found this recipe and I am dying to try it out! It sounds so delicious. Do you have any tips for making these into cupcakes? Thank you! You will love this cake Clara! I haven't tried baking it into cupcakes -- I am sure it is fine. I would just watch them baking carefully because I am sure they won't take as long as baking it in a cake pan. Maybe even pull them out right before you think they look done to keep them from drying out. Enjoy!